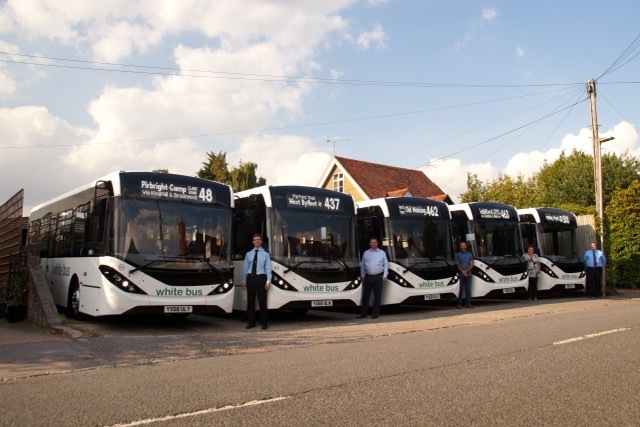 Mistral Bus & Coach have supplied five new 8.9m E200’s to White Bus Services. The vehicles have been successfully operating on routes previously serviced by Abellio in Berkshire and Surrey. Two years ago, White Bus Services was taken over by Simon Rowland and the Fernhill Travel owners, Richard and Martin Holgate, to form Rowgate Group Ltd. Since the takeover the business has stepped into the 21st century, adopting several new technologies to create significant improvements and efficiencies in all areas of the business. These include vehicle tracking, IT/website enhancements, refurbished office space and new buses and coaches. Passengers have been responding well to White Bus Services taking a more professional approach, epitomised by new staff uniforms and new euro 6 E200’s. The changes brought in by the ownership have had an extremely positive effect on increased passenger numbers, as well as overwhelmingly positive feedback from customers. As Alexander Dennis was still building the vehicles when the contracts began, Mistral supplied four temporary E200’s as a stop gap. This is a great example of how Mistral Bus and Coach can supply several vehicles at short notice. “It has been a pleasure working with such proactive management and refreshing to see an independent operator thriving in a tough market. We hope to carry on supporting White Bus for many years to come.” Freddie Fuller, RSM of Mistral Group.